One of the twelve Minor Prophets who describes himself as "the son of Cushi, the son of Gedaliah, the son of Amariah, the son of Hezekiah, in the days of Josiah, the son of Amon, King of Judah" (Zeph. i. 1). He seems, therefore, to have been a descendant of Hezekiah, King of Judah, since otherwise only the name of his father would have been given (comp. Isa. i. 1; Ezek. i. 3; Joel i. 1). If he was of royal descent, he probably lived in Jerusalem; and evidence of this is seen in his prophecies, where he describes various parts of the city. According to the first verse of the book which bears his name, he flourished during the reign of Josiah, and on the basis of his utterances the majority of modern scholars date his activity prior to the reforms so rigorously inaugurated and promulgated after 621, the pictures of corruption and the approaching foe being most appropriately referred to the situation in Judah during the early years of Josiah and the Scythian invasion. The contents of the book of this prophet fall into two parts: i. 1-iii. 8, the coming judgment on the world, including Israel and the nations; and iii. 9-20, a promise of universal salvation. Zephaniah's special denunciations are directed against false worship and irreligion. The calamity will find every one, even in the hiding-places of Jerusalem; Philistia, Moab, Ammon, Cush, and Assyria shall be overwhelmed by punishment and disaster; Jerusalem in particular, being rebellious, corrupt, and disobedient to the word of Yhwh, shall fall under the divine wrath. Yet, on the other hand, God's promise is made known to the nations, that He will so purify them that they may call on Him, and all shall bring Him offerings. After the storm of judgment Israel shall be humble, and shall trust in Yhwh alone. New social conditions shall arise, and justice and righteousness shall prevail, so that the redeemed shall rejoice in the Lord. Zephaniah is a forceful book. Its language is vigorous and picturesque, and betrays an acquaintance with the Earlier Prophets. The ideas most emphasized are the providential control of the nations of the world, the necessity of purity and justice as opposed to the prevalent corruption and injustice of the day, and the refining value of judgment and suffering. 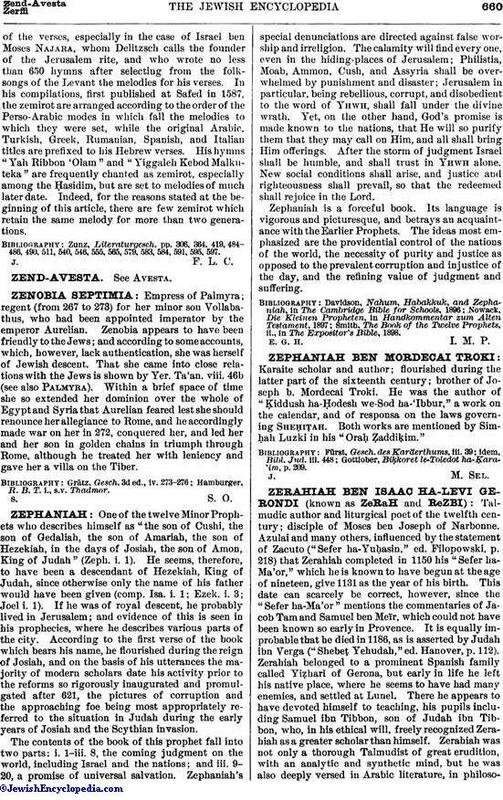 Smith, The Book of the Twelve Prophets, ii., in The Expositor's Bible, 1898.